I made this cake for my husband’s birthday. First I wanted to make his birthday favorite Julishka, but then I thought maybe this year I’d make something new and different. He likes chocolate and he also likes caramel, so what could really go wrong?! I remembered a while ago I made a Black Forest Cake which didn’t require any flour, so I thought that would be a good start. I’ve changed a few things around: increased almond meal to 100 g and then substituted bread crumbs with organic shredded coconut. 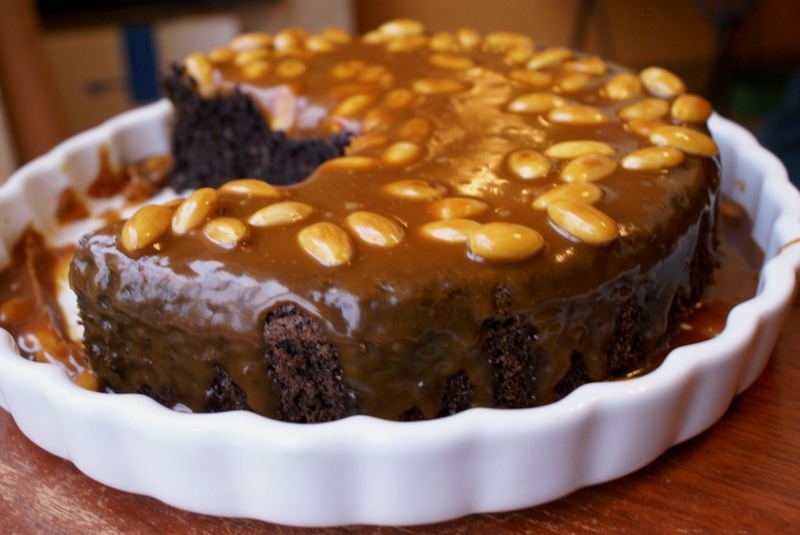 I also remembered a cake my mom used to make with the almond caramel sauce, for which I don’t have a recipe, but thought I could recreate the sauce and pour over my chocolate cake. The cake turned out so much better than I hoped for. 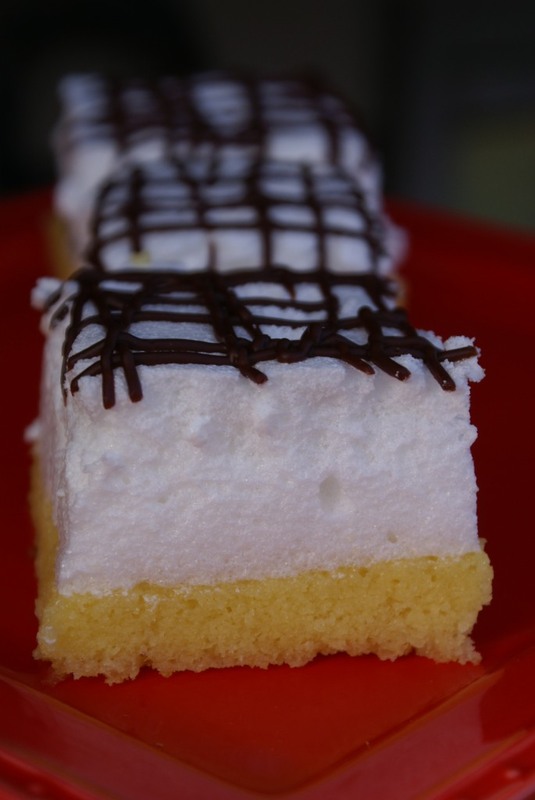 It has a nice texture, it’s moist and not too sweet at all. 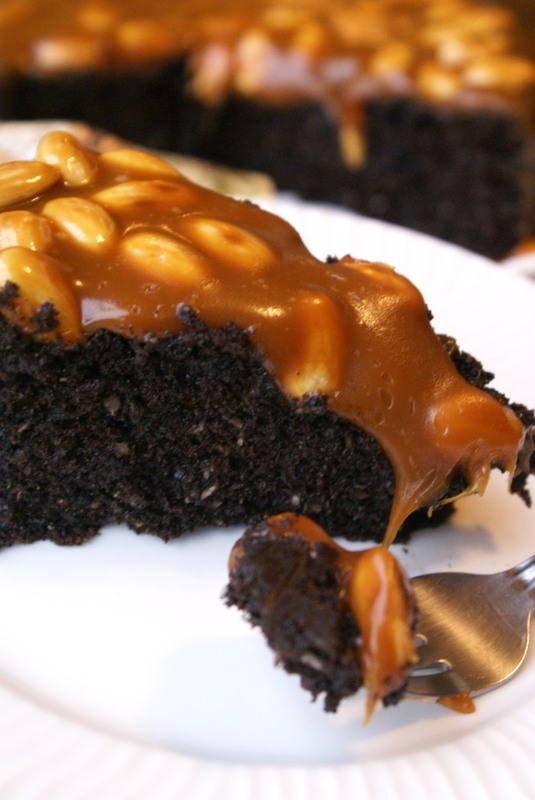 The sweetness of caramel fits really good with this cake and almonds give it a nice crunch. It’s definitely a winner! Now beat egg yolks, 1 whole egg, water and sugar until very pale yellow, add vanilla extract and cocoa. 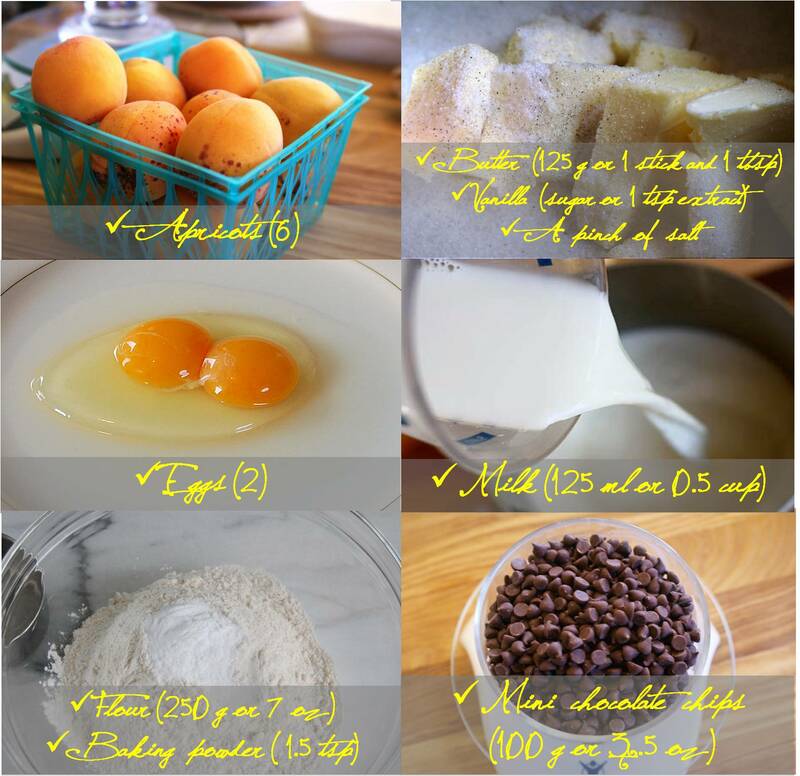 Make sure cocoa is well blended with eggs. 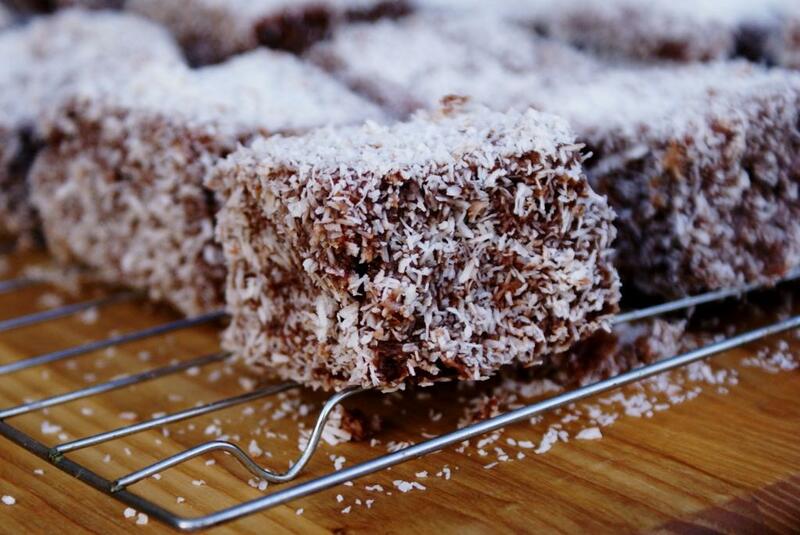 Fold in almonds and coconut. 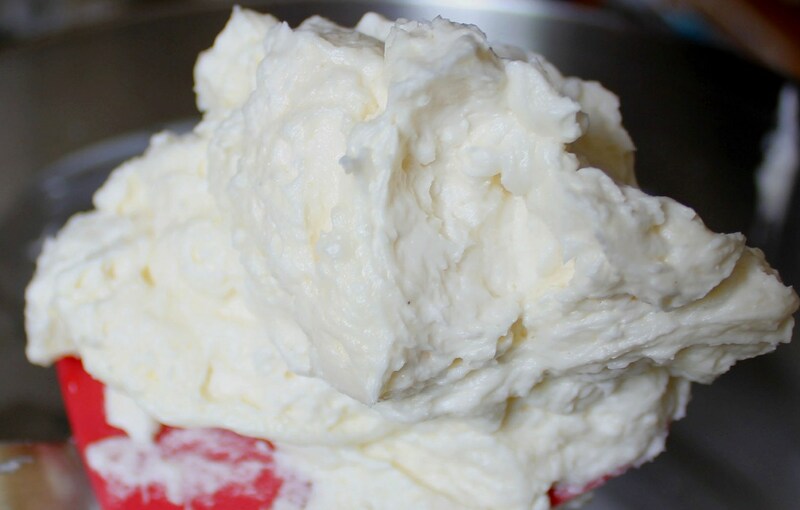 At the end add egg whites and mix all together by hand until just incorporated. 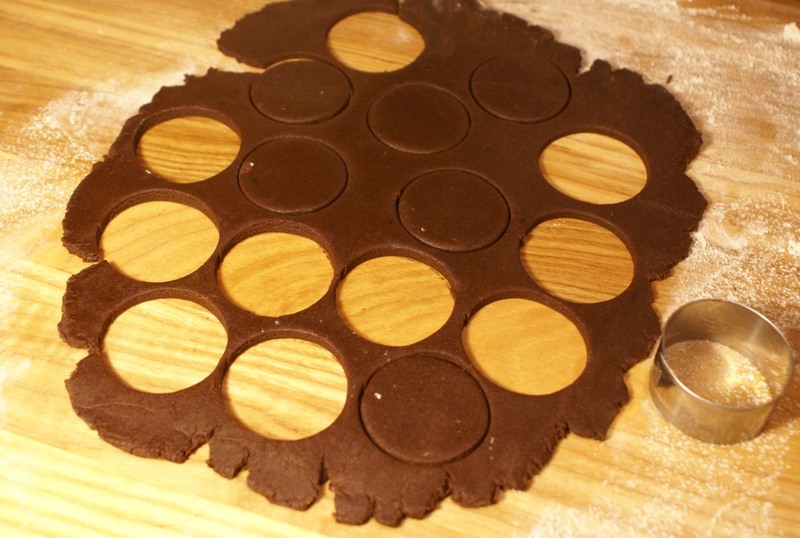 Pour into a round 8 inch (20 cm) cake spring form lined with parchment paper. Bake at 365 F (185 C) for about 30 minutes. 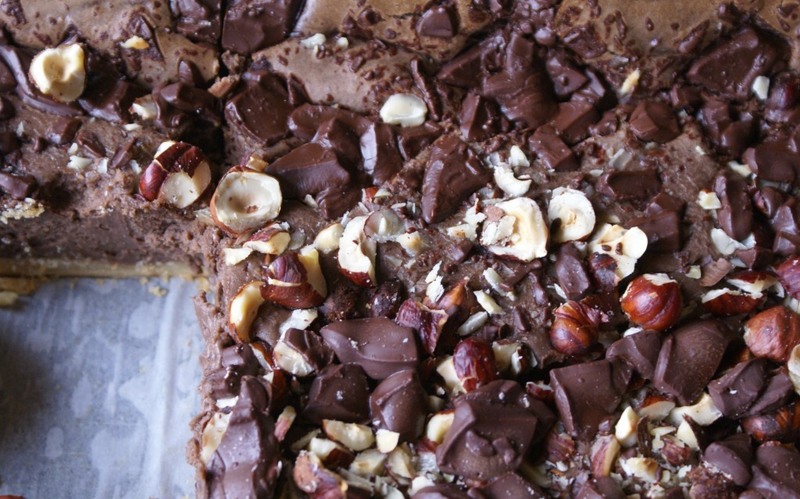 While cake is baking roast your almonds until light brown and fragrant; set aside to cool. 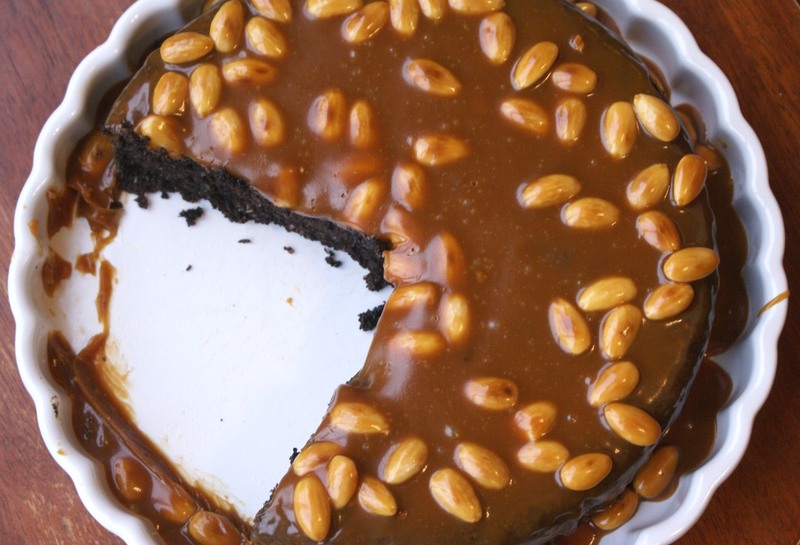 Remove the cake from the oven and cool completely and then make caramel topping. For the topping pour sugar into a heavy bottom pot and melt at a medium temperature. Have butter and cream handy. Once the melted sugar starts boiling add butter and cream at once. Lower the temperature and cook for another 5 minutes. 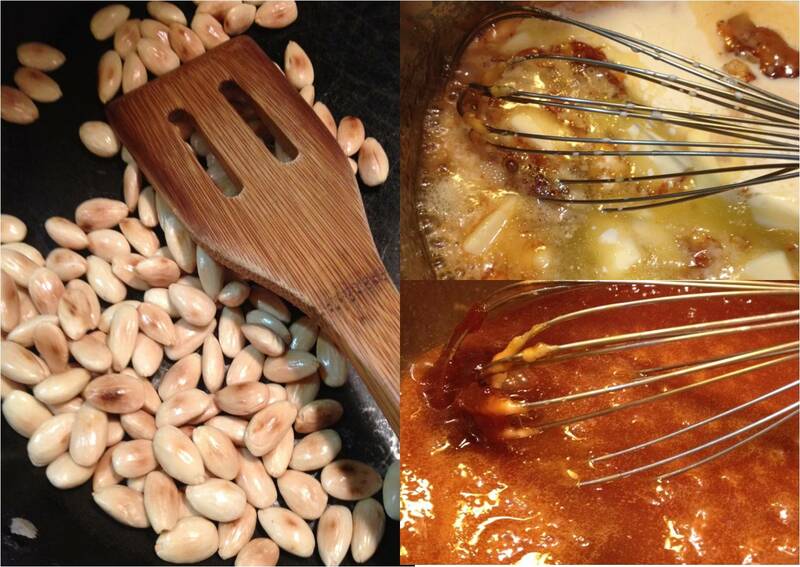 Add roasted almonds and let it cool for about 5-10 minutes. 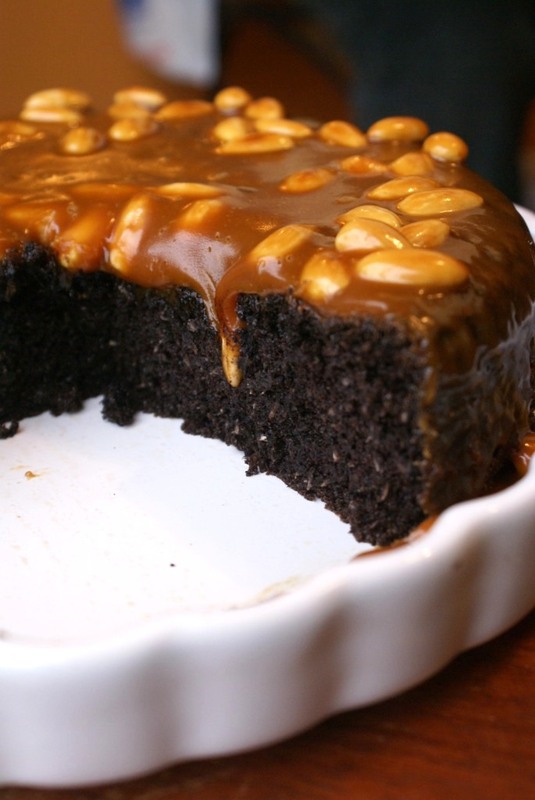 As it cools caramel will become thicker. Pour over cake and serve. 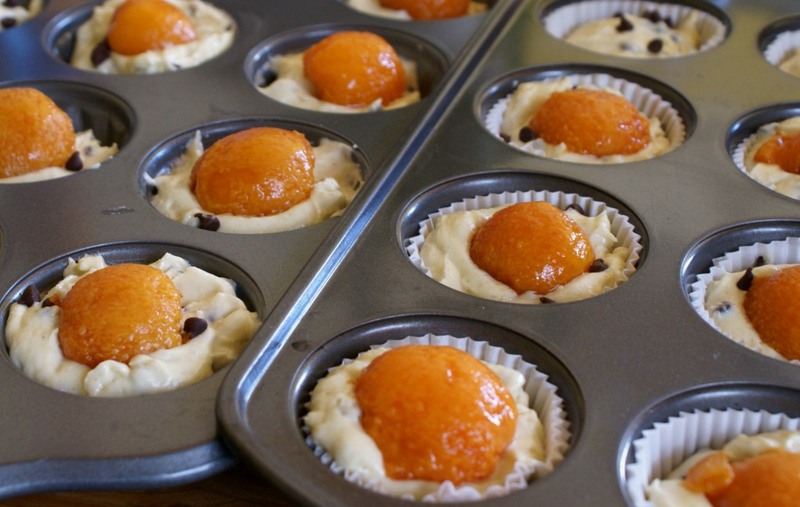 Keep the cake at the room temperature, or if keeping in the fridge remove 30-60 minutes before serving. It’s been a while… I promise I didn’t forget about you! 🙂 I find it (just a bit hard) to be a baker and try to be on a weight-loss plan. Finally, I think I am figuring out how to have these two coexist, so I am back to doing what I love! 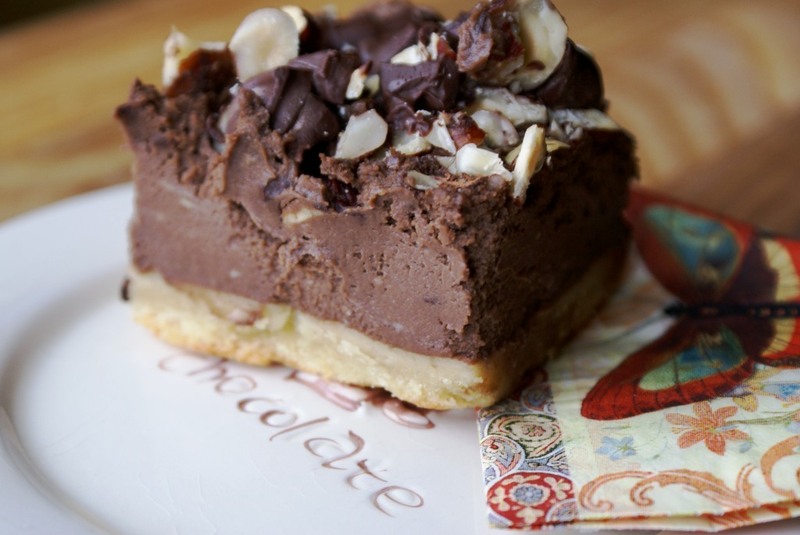 Idea for these chocolaty bars came at a moment which I like to refer to as “baking inspiration”. 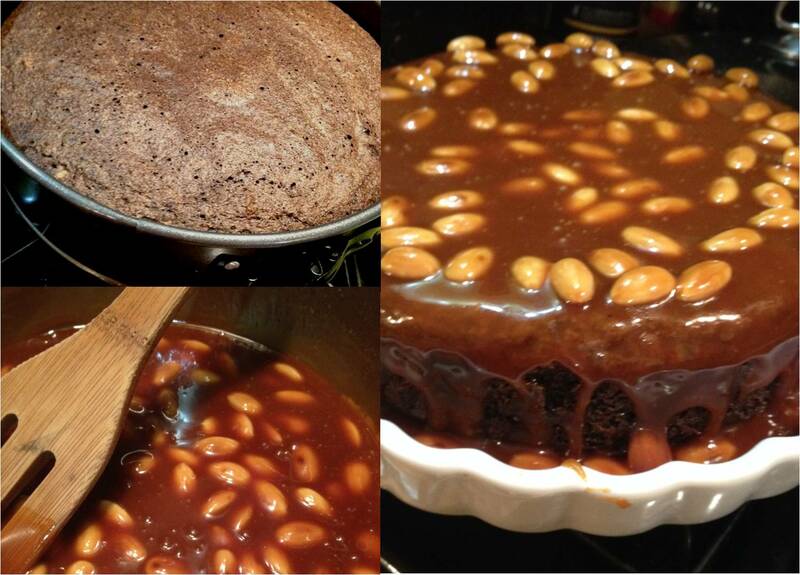 This recipe is my own creation and I dedicate it to all my good friends spread all over the world. Some of you I have known since childhood days, some of you are brand new friends, with some of you I have reconnected again and some of you I’ve met in this virtual world. All of you have brought a part of you and your world to share and I feel great deal richer and happier because of it. Here is to FRIENDSHIP! Beat butter, sugar and vanilla until creamy. Beat in Bailey’s, egg yolks, flour and salt. 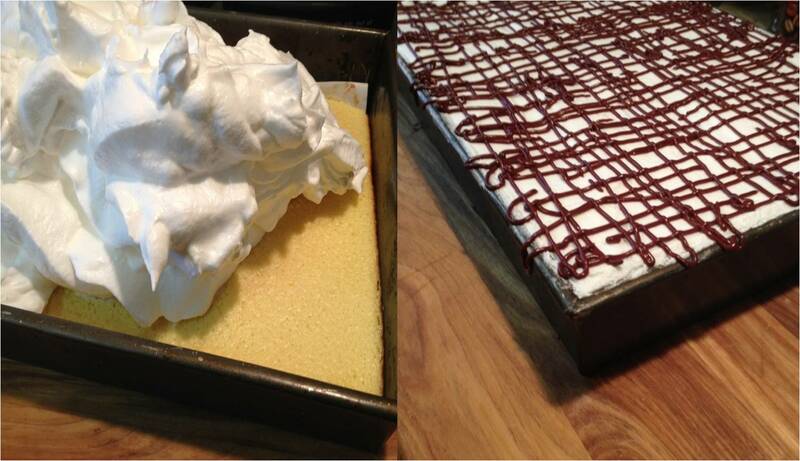 Press mixture into the bottom of a 13X8 inch (33X20 cm) baking pan, previously lined with parchment paper. 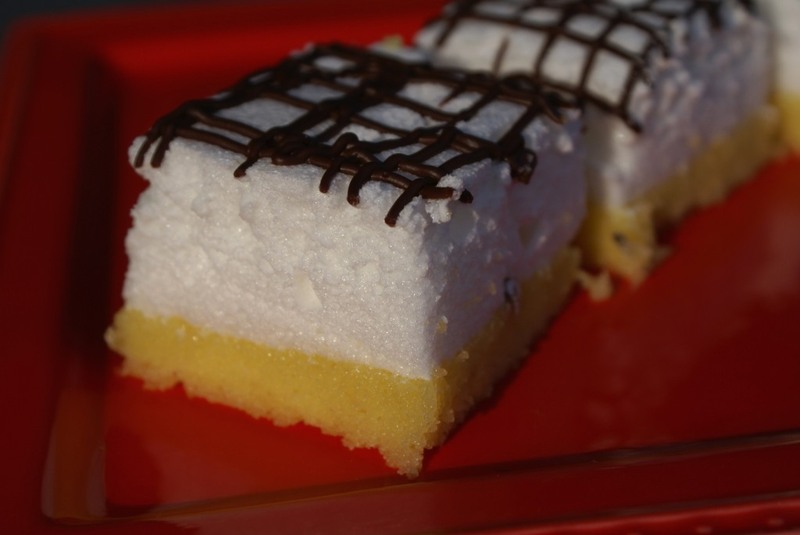 If you desire thinner bars you may want to use a larger pan, but it needs to be at least 2 inches deep. My bars have turned out pretty thick because I’ve used 13X8 inch pan. For the filling beat cream cheese, sugar, vanilla and cocoa until smooth. Add melted chocolate, cream, Bailey’s and lightly beaten eggs. Pour the mixture over the crust. 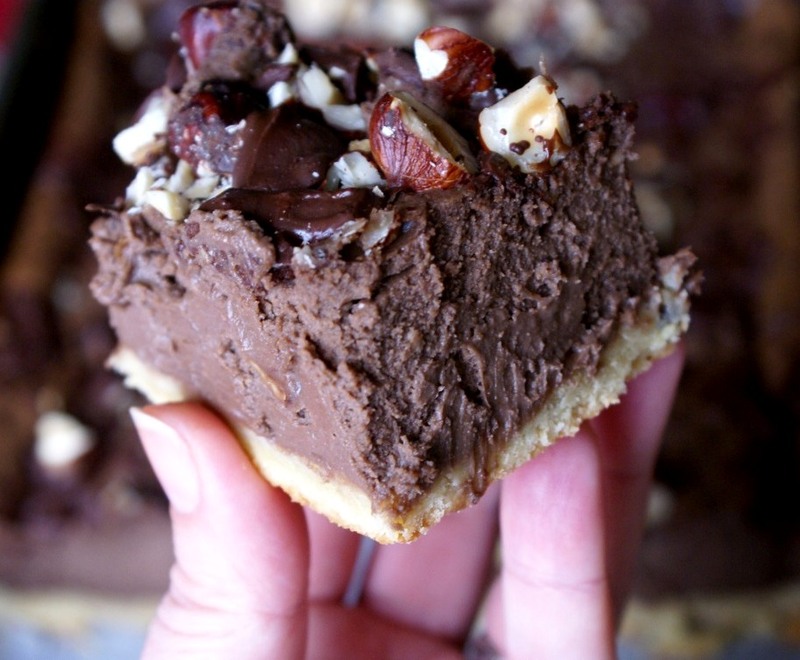 For the decoration cut chocolate into chunks and coarsely chop hazelnuts, sprinkle all over the top. Bake at 350 F (180 C) for about 40 minutes. Turn off the oven and let it set another 10 minutes inside. Cool completely, cut into bars and serve. Hello my friends! I hope everyone is doing well; I missed you all! 🙂 I took an involuntary baking break while I was trying to complete some remodeling projects in the house before the winter gets here. I have not completely abandoned my artistic expression, I started two paintings and plan to finish them before the end of the year and I’ve discovered a new passion: poetry. I’ve always liked reading poetry, but have never tried to write anything. Well, a few weeks ago a “What if I tried” thought crossed my mind, so I started thinking and putting the words together and for now they sound very good to me. I am not sure if I am going to share it with the world yet, but I am sure of one thing: writing poetry brings me so much joy! 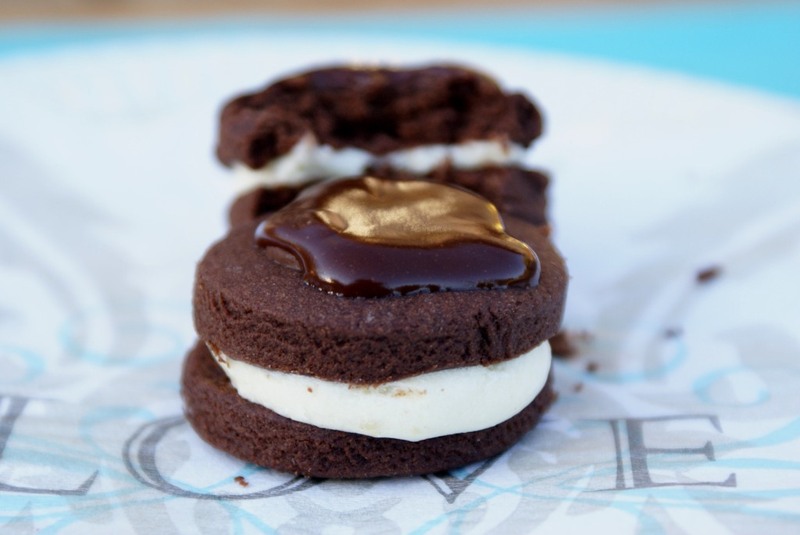 My hope is that these chocolate sandwich cookies will bring you joy of making and of course joy of tasting! They are a treasured recipe from my old-yellow-falling-apart recipe book that I started when I was about thirteen years young. These cookies are not too sweet. Cocoa gives them just a hint of gentle bitterness and the vanilla frosting just a right amount of sweetness. 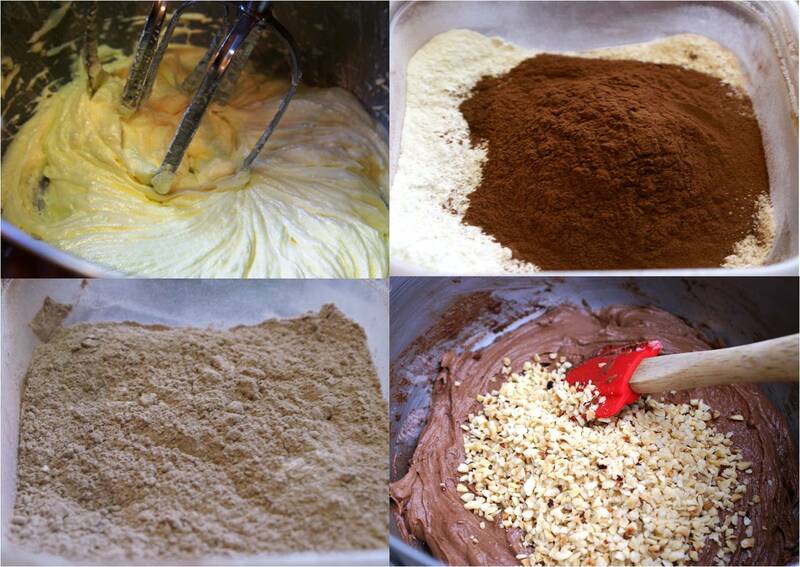 For the cookies, combine all dry ingredients and mix for a few minutes. 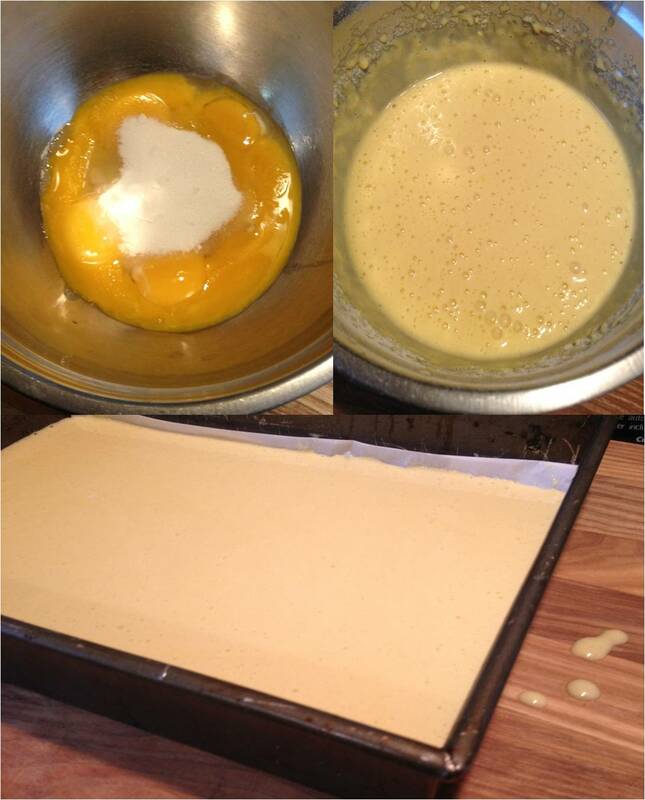 Add egg and butter and mix on slow until resembles a crumbly mixture. Flour your working surface and knead the dough by hand until nice and smooth. 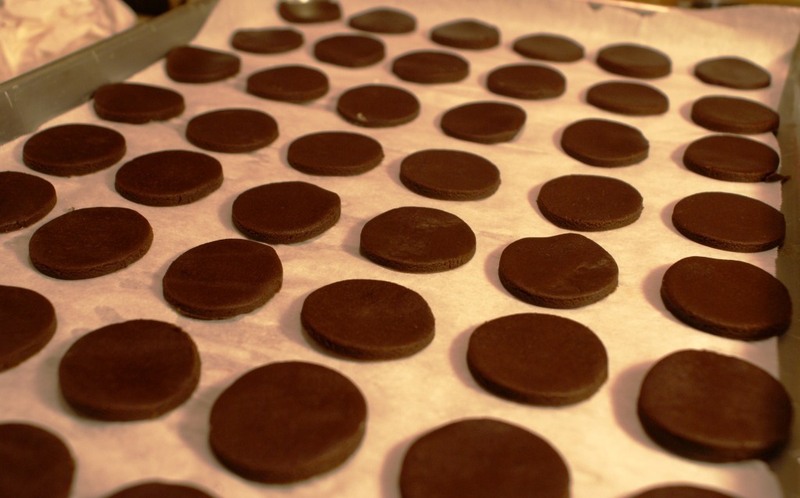 Flatten it, cover with plastic wrap and leave in the fridge for about 30 minutes. 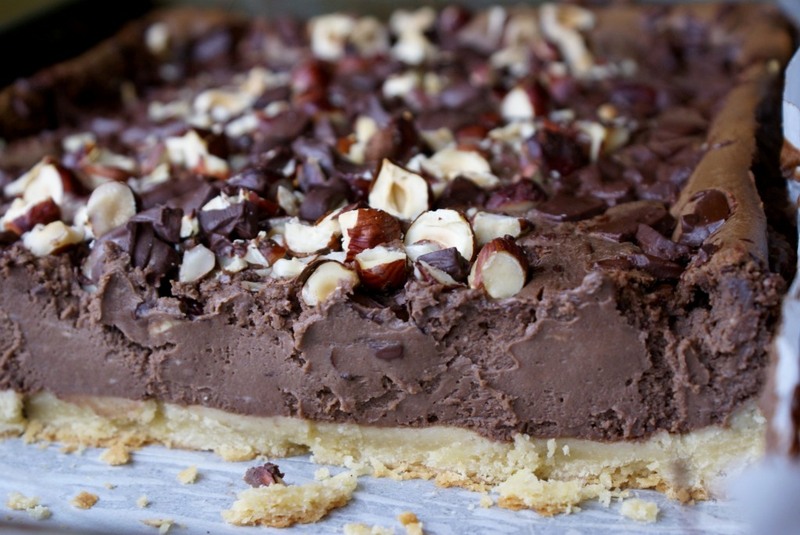 While the cookie dough rests in the fridge prepare the filling. 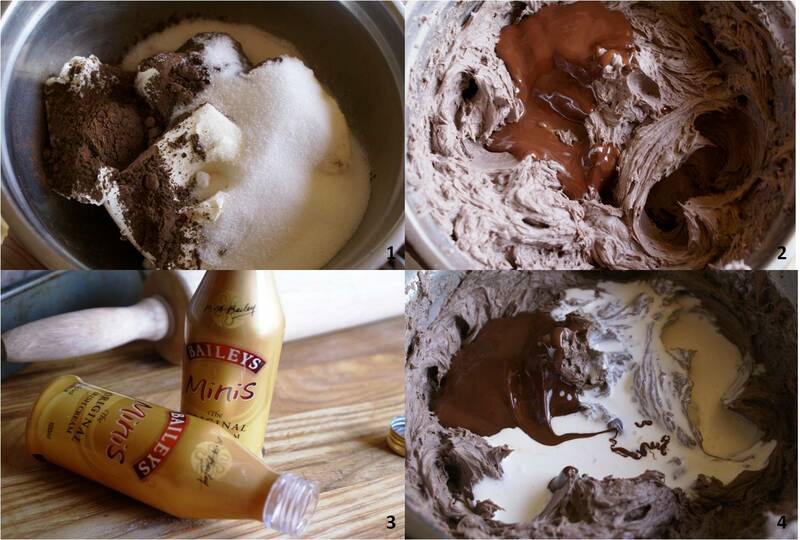 Mix the flour with a couple of spoons of milk until smooth. Let the milk boil at a low temperature and pour the flour mixture into boiling milk. 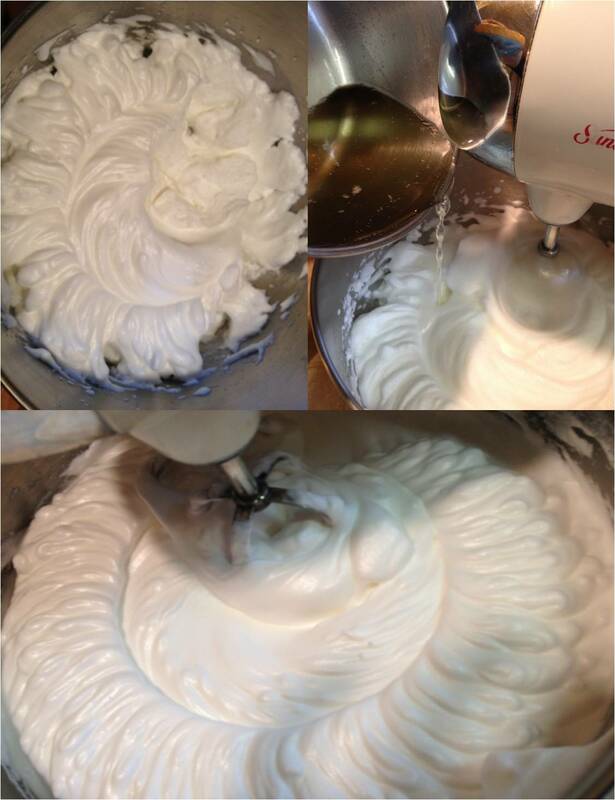 Whisk constantly until it starts thickening, then remove from heat and let it cool completely. In a mixing bowl combine butter, powdered sugar and vanilla. Mix all together. You may add an egg yolk for a nice color, but it’s not essential. Now add this mixture to the flour base and whip it at high speed until well combined and fluffy. Bake at 180 C or 350 F for about 12-14 minutes. Cool down completely. Glue two cookies together with the frosting. 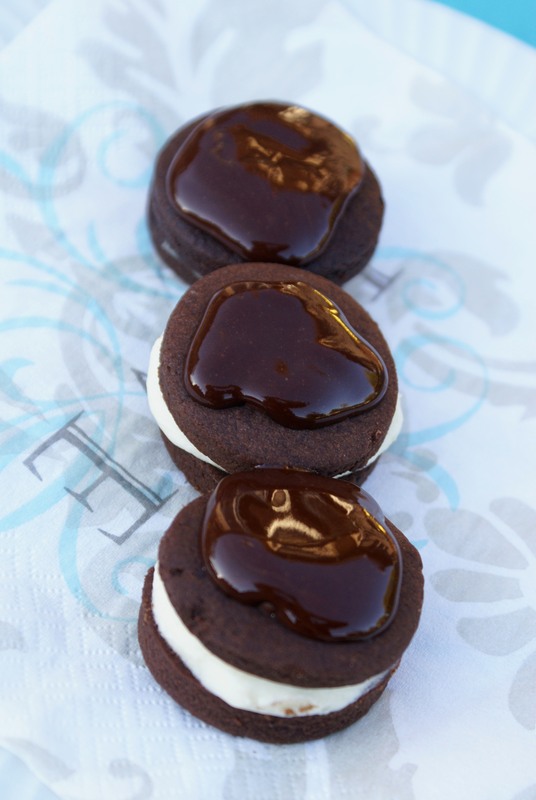 Melt chocolate and butter, let cool down for a few minutes and pour a teaspoon of the glaze on the top of each cookie. 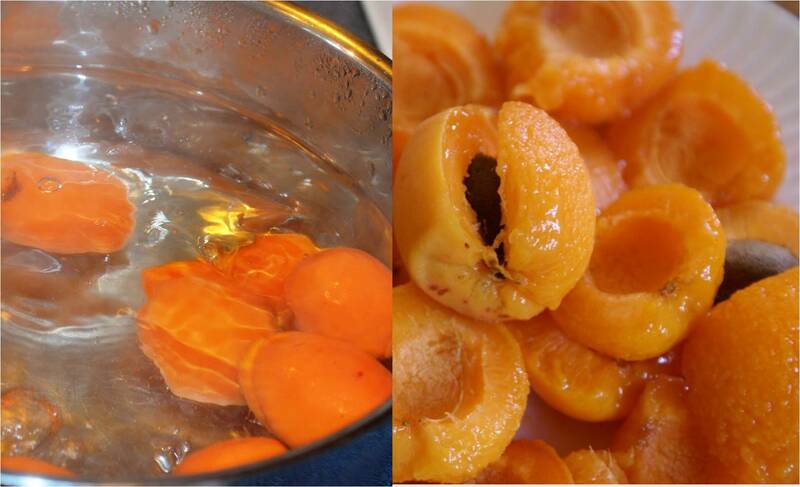 Place apricots into boiling water for a 1/2 – 1 minute. If they are soft about ½ minute and if they are harder about 1 minute. Remove the skin, half them, pit them and set aside. Beat butter, sugar, salt and vanilla at a high speed and until fluffy. Add eggs one by one until nicely incorporated into batter. Combine flour and baking powder. Add to batter alternating with milk, until both is used up. 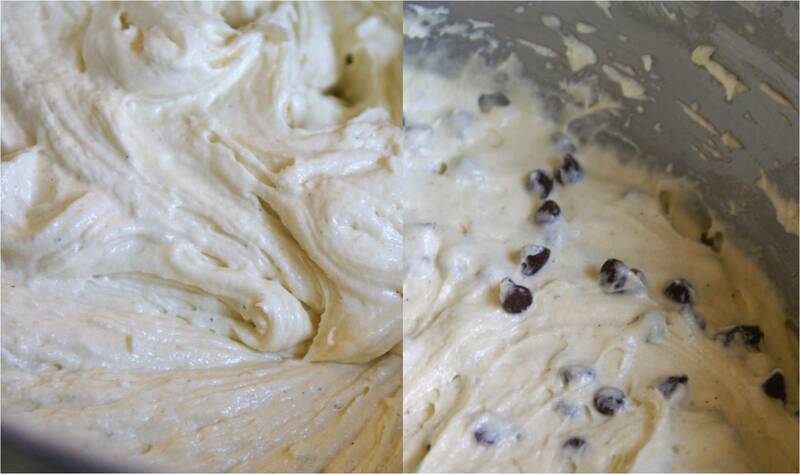 At the end, mix in mini chocolate chips. 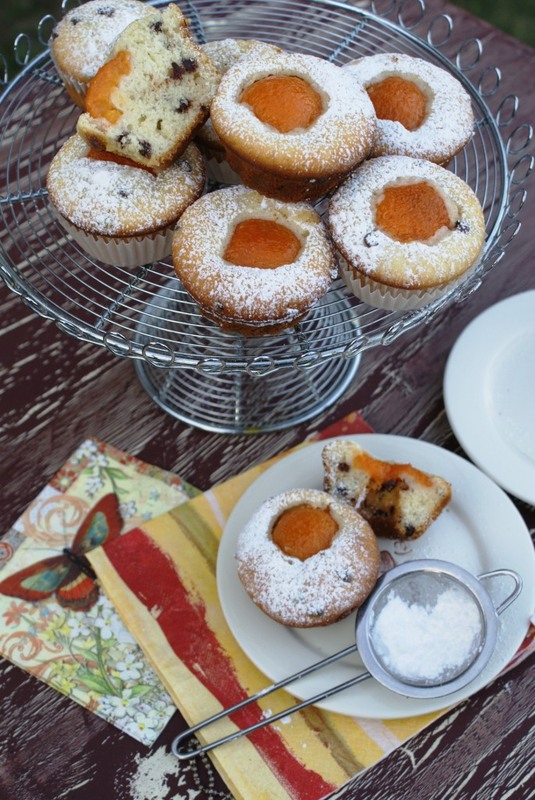 Fill the batter into muffin pans lined with muffin cups or into mini bunt cake tins. 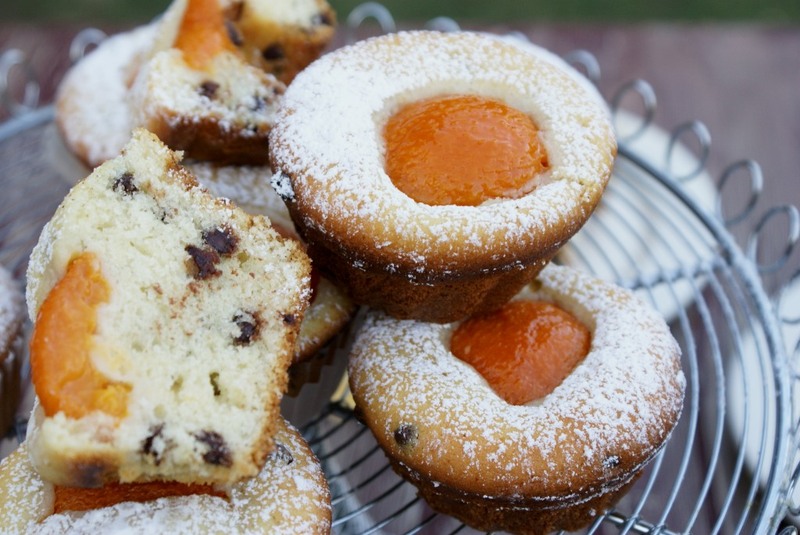 Place an apricot half on each muffin. Bake at 195 C (385 F) about 20-25 minutes. 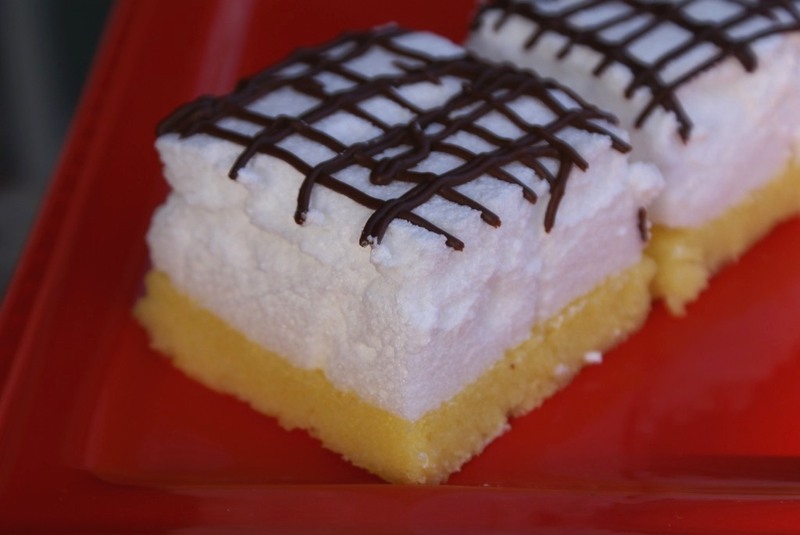 Let cool down, remove from tins and sprinkle with powdered sugar. Hello friends! Oh, how happy I am to say that Spring is in the full swing in my neck of the woods! I’ve been so distracted by its beauty, I could hardly manage to do anything inside the house (including baking). Family wasn’t happy about not having goodies for a while, so that’s why I resorted to this easy cake recipe from an old German baking book. It doesn’t require much time or skill and the result is more than satisfying. 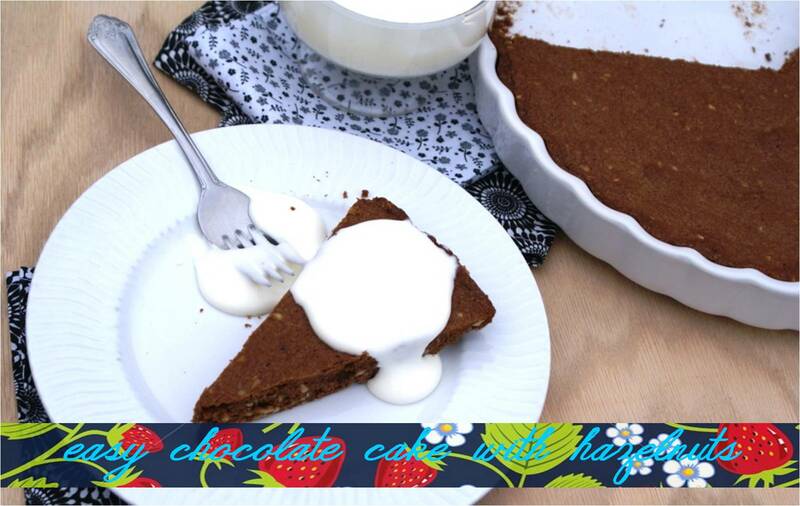 This simple chocolate cake can be paired up with whipped cream, vanilla ice cream or topped with fresh berries or berry sauce. 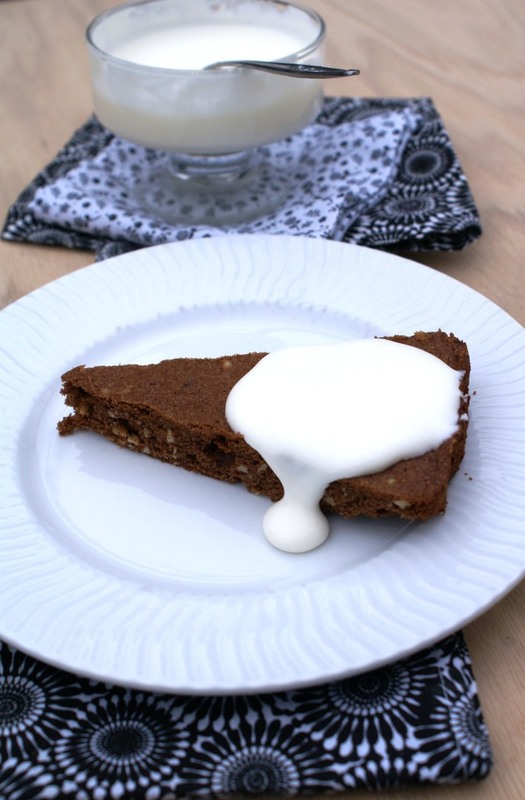 It is easy enough to make for those who are new to baking or for the times when you learn that friends are coming over and you don’t really have a lot of time to prepare a dessert. Beat butter and sugar at a high speed until nice and fluffy, add vanilla extract and eggs. 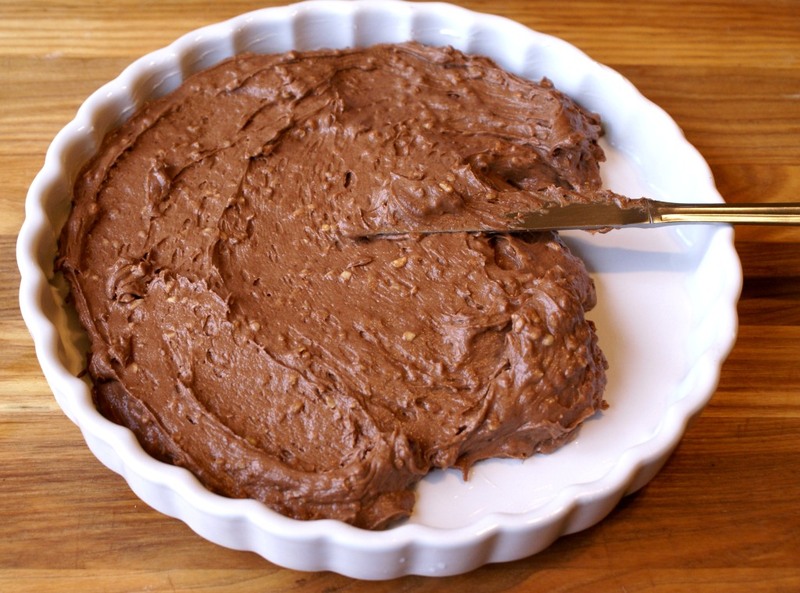 In a medium bowl combine flour, baking powder, cocoa powder and add to the butter mixture. 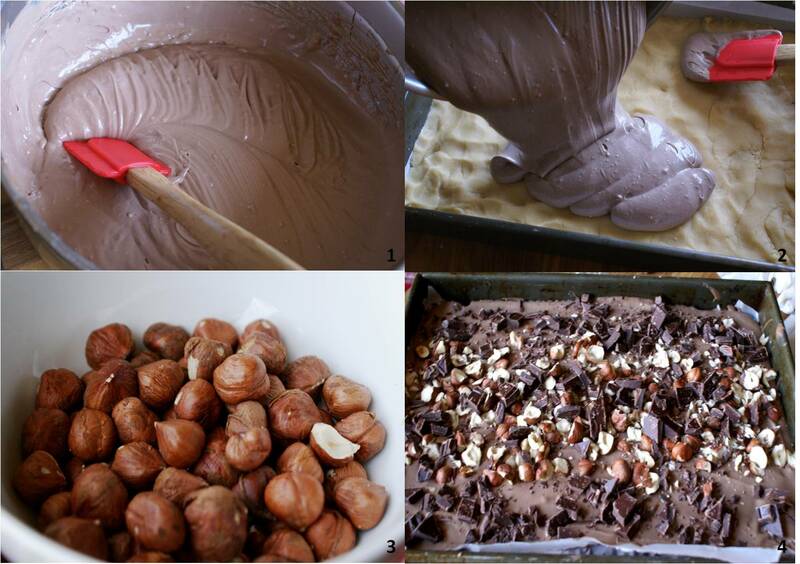 Reduce the mixing speed and mix until creamy; add hazelnuts. 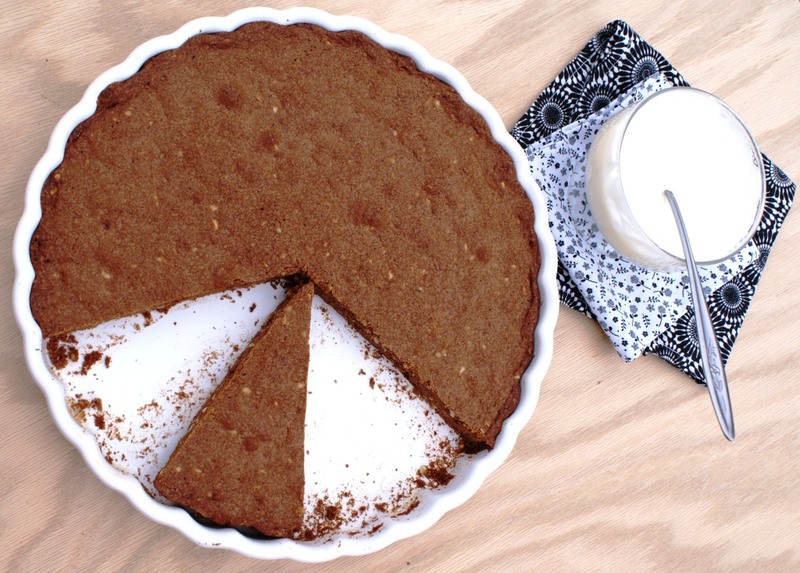 Rub a bottom and sides of a tart pan with butter and pour the cake batter in. Bake at 175 C (350 F) for about 20 – 25 minutes. 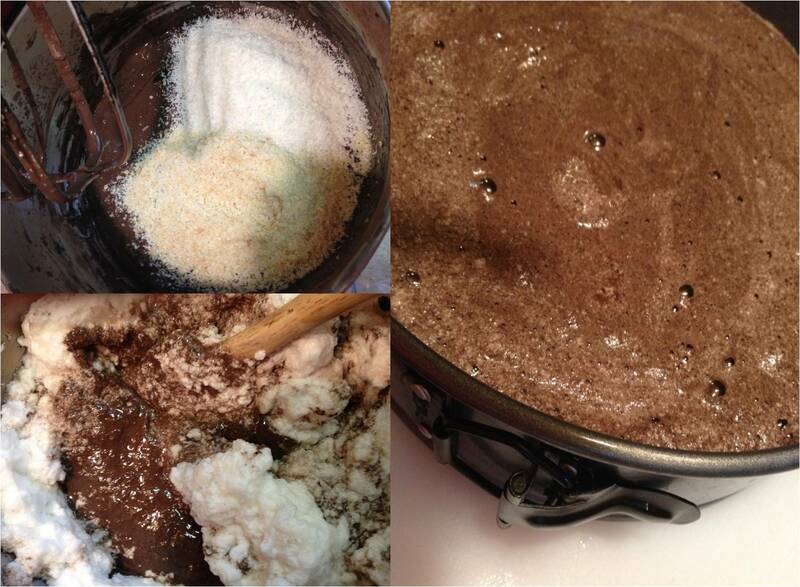 If desired sprinkle the cake with some powder sugar.